Valefor is the first Aeon that Yuna can summon, which you receive in Besaid after conquering the Cloister of Trials. She resembles a large eagle and stays afloat. Therefore enemies on the ground have a harder time hitting than with other Aeons. 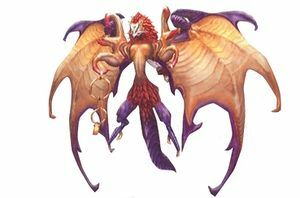 Although Valefor starts out as a useful asset to your party, when you get the other Aeons, she will probably end up weak. Valefor's damage will be able to exceed 9,999 once Yuna activates her Celestial Weapon, Nirvana. Valefor is the only Aeon with two Overdrives. Energy Ray - default Overdrive, in which Valefor shoots a ray of energy under the enemies, blowing up the ground under them. Energy Blast - a more powerful version of Energy Ray with a longer recharge time that can be obtained by talking to a little girl with a pet dog in Besaid. Energy Blast is a lot more useful than Energy Ray. She will attack the enemies with a large energy beam through a spinning disc (often killing the subject). It has a longer recovery time than a regular attack. Penetrates Protect even though it is a physical attack. 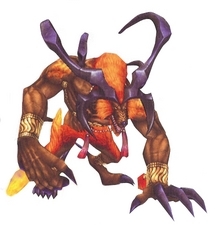 "Ifrit encases its foes in a swirling ball of fiery vengeance and detonates it for massive damage to all enemies. All of Ifrit's attacks can exceed 9999 HP damage once you have activated Wakka's legendary weapon, World Champion." - Final Fantasy X Official Strategy Guide. Shiva's Fayth is a woman wearing a cloak over her head. As an ice being, Shiva is auto-equipped with the Ice Eater ability, letting her add ice damage to her HP when damaged. Fire spells do extra damage to her. Her Aeon attack is Heavenly Strike, and Diamond Dust is her Overdrive. Activating Lulu's Onion knight will allow her to break 9,999 damage. Shiva drops a large chunk of ice on an opponent's head. This attack has the potential to delay the enemies attack. This outcome is only sporadic against more powerful enemies, but does succeed occasionally. Shiva casts an icy plain across all enemies inflicting elemental ice damage. She then snaps her fingers in order to shatter the icy plain to a sea of icy shards, leaving Diamond Dust an aptly named overdrive. Bahamut is one of the most powerful Aeons in the game. He is the strongest that you obtain as part of the story, and can do over 9999 damage when you acquire him. This chart explains which attack will be executed based on various values realized by the motivation function. Yojimbo is one of the three optional powerful Aeons. He initially has a strong evasion level but lower than average health and defenses. You have to pay an amount of Gil for him to attack. Daigoro, a weak dog attack. Kozuka, throwing three daggers at the enemy for medium damage. Wakizashi, a powerful katana attack that will either hit one or all enemies. Zanmato, an infallible 1-hit-kill attack. The attack chosen will depend on the game's evaluation of a sophisticated motivation function that depends on the Yojimbo-resistance level of the opponent, Gil payed relative to Gil wealth, a hidden compatibility level, whether or not Yojimbo is in overdrive, and a random number generator. Yojimbo's attacks are automatically Penetrating. You cannot teach him any abilities. His Overdrive only increases the probability of using Zanmato. Anima is Seymour's Aeon. Her first appearance is after the Blitzball game in Luca. Seymour also summons her in battle against you while at Macalania. However, you can also get this powerful Aeon to fight for you. To convince Anima to fight at your side, you must open all the hidden chests found in every Cloister of Trials. The details are found on the Baaj Temple page. This attack inflicts damage and Death to the opponent. Anima takes enemies into oblivion (hence the name). Inside Oblivion, she breaks the chains that ties her hands down and delivers hit after hit. This means that you don't need Break Damage Limit to inflict a lot of damage with this Overdrive. When you first get her, she comes with all elemental Black Magic spells, plus Bio and Death. She also comes with a lot of status inflicting attacks, including Zombie Attack. To obtain the Magus Sisters, the two seals in front of the door to the chamber of the Fayth in Remiem Temple must be broken by using the Flower Sceptre and Blossom Crown. 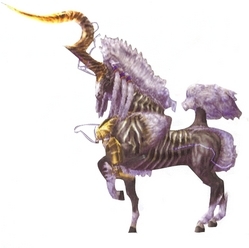 The Flower Sceptre can be obtained by defeating the first five of Belgemine's Aeons (up to and including Bahamut), who conveniently stands in the middle of Remiem. The Blossom Crown is awarded at the Monster Arena for capturing at least one of every fiend from Mt. Gagazet. After getting the two items, approach the chamber of the Fayth at the back of Remiem temple to break the seals and get your three new Aeons, Cindy, Sandy and Mindy. You can enter the chamber again to receive a Luck Sphere. In general, the Magus Sisters will have the highest stats of all the Aeons (particularly Sandy's strength and Cindy's HP), and as all three fight at once, will be a good choice for tackling the monster arena at lower levels. The catch is that you can't directly control the Aeon's actions, but only really 'advise' them i.e. choose whether to attack, cast offensive magic, support magic and so on. Does about 1.5 times normal attack damage. Attacks at 10% power 15 times to give 1.5 times normal attack damage, however as a multi-attack the damage can be significantly increased if your normal attacks would be over 99999 and if you have a high luck stat (causing critical hits). This attack hits six times for high damage (based on your magic stats). It is performed by selecting "Combine Powers" when all three sisters' Overdrive bars are full. This page was last edited on 26 May 2017, at 15:12. This page has been accessed 145,465 times.